Worldwide icon-chevron-right North America icon-chevron-right United States icon-chevron-right California icon-chevron-right Los Angeles icon-chevron-right The best farmers’ markets in L.A. 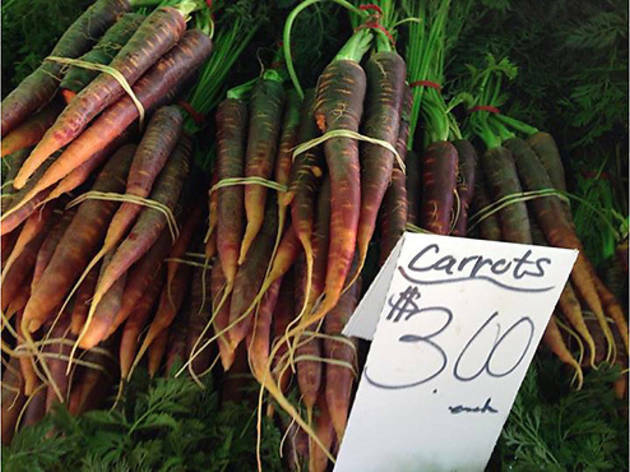 The best farmers’ markets in L.A. 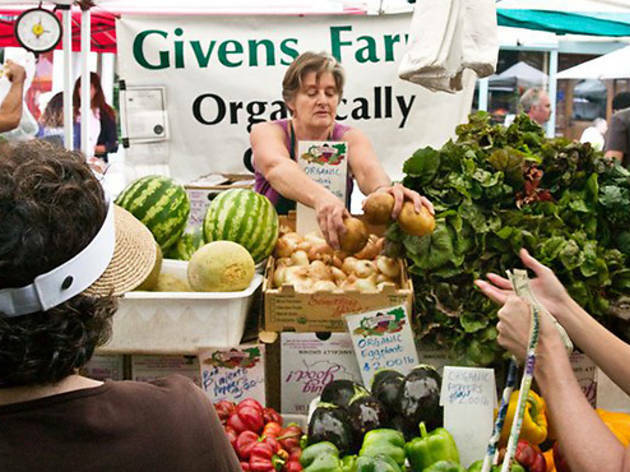 Without a doubt, Los Angeles has eternal bragging rights when it comes to its phenomenal farmers’ markets. Oh, you think you’ve tried a good blood orange? 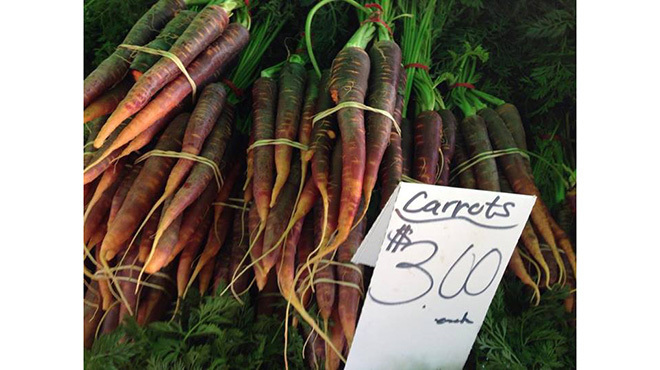 Come back to us after visiting the Santa Monica Farmers’ Market on a Wednesday morning. These seasonal markets are where the best restaurants in L.A. buy their produce, where you can indulge in your love for cheap eats with endless sampling, and where cartons of avocados seem to stretch as far as the eye can see. 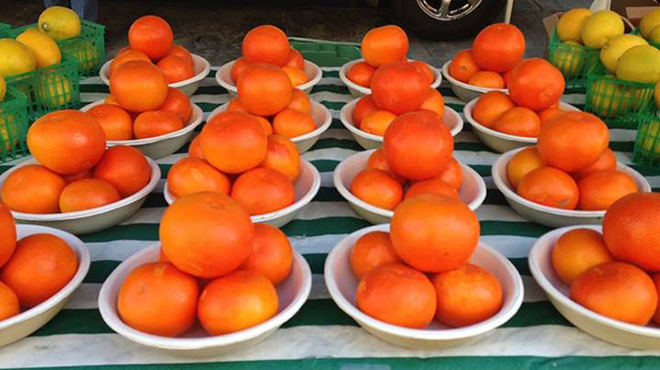 Check out our picks for the best farmers’ markets on the Westside, Eastside and in the Valleys, then grab your reusable bag and start shopping. The next time you’re at a restaurant and tempted to ask the waiter where your astoundingly fresh beets came from—don’t. 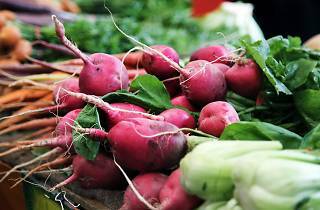 The beets (and, likely, the majority of the dish’s ingredients) probably came from the Santa Monica Farmers’ Market. 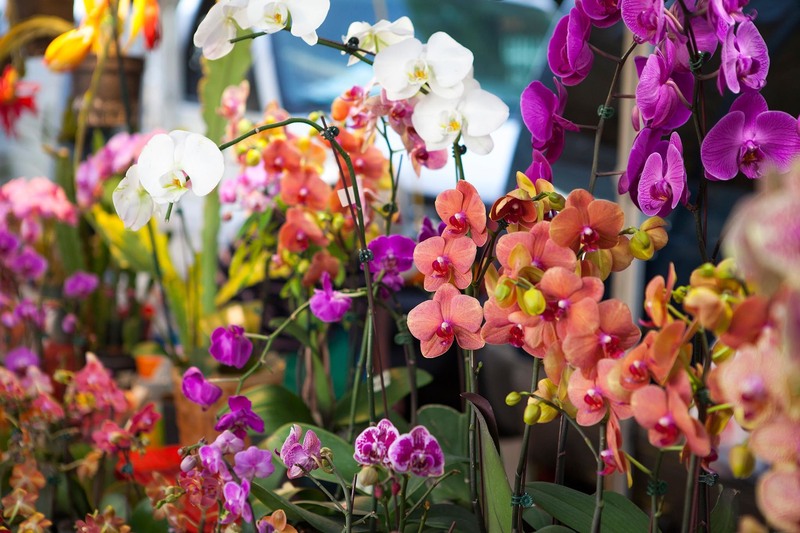 While the market occurs on a couple of days (Wednesday, Saturday and Sunday) in various parts of Santa Monica, the best day to go is on Wednesday along Arizona Avenue. This is where L.A. chefs go to grocery shop. 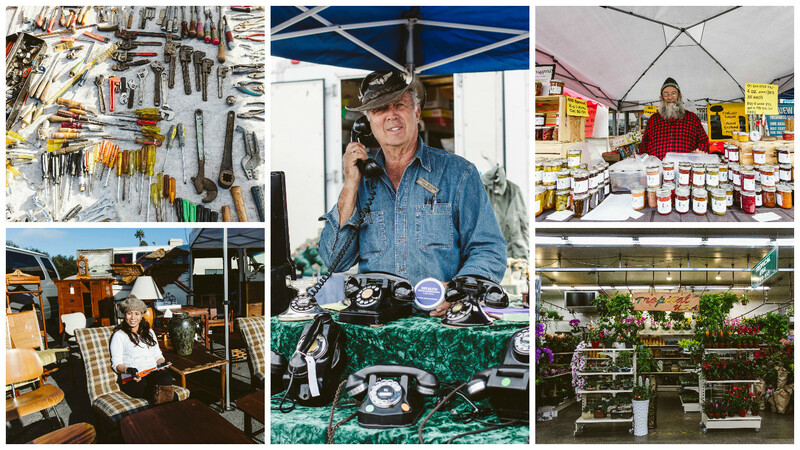 After parking in one of Santa Monica’s public parking structures (many of which are free for the first 90 minutes or only $1 per hour), head on over to the market, where you’ll likely find chefs picking up basil, 10-pound bags of leeks or jars of local honey. On any given Sunday at the Beverly Hills Farmers’ Market, you may find the following: a pop-band performance comprised of middle school kids; the smell of French crêpes luring passersby in for chocolate and nutella delicacies; Forbidden Fruit Orchard’s Sandy, hocking organic blueberries and her delectable jams and olive oils. 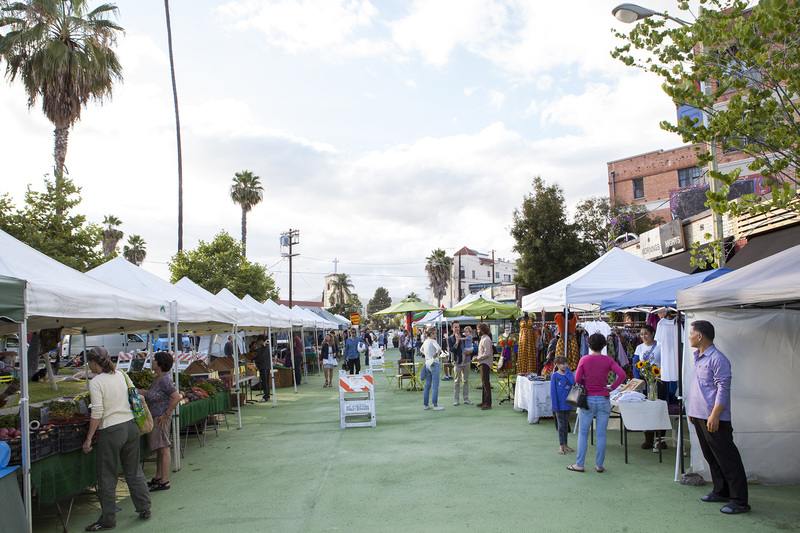 The market, which can be found along Civic Center Drive between Third Street and Santa Monica Boulevard, features more than 60 farmers and vendors. It’s also a great spot for kids: At the Kid Zone, pony rides and a petting zoo entertain fidgety children, while culinary-minded young’uns can enjoy Cookin’ Kids every second Sunday. Drop your child off to learn about fruits and veggies in season, the farmers behind the produce and recipes to bring back home for tonight’s dinner (they’ll be doing the cooking, of course). 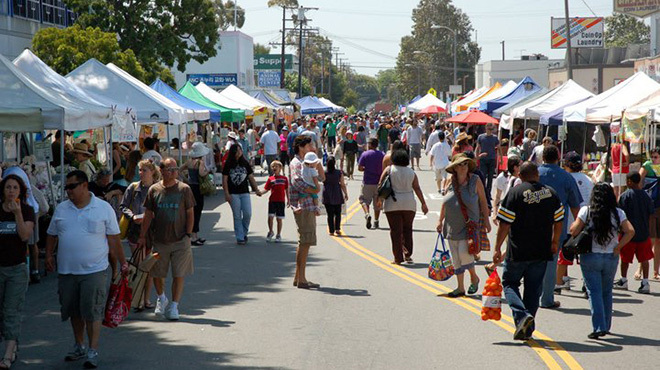 Located just south of San Vicente Boulevard, the Brentwood Farmers’ Market draws in crowds of locals every Sunday. 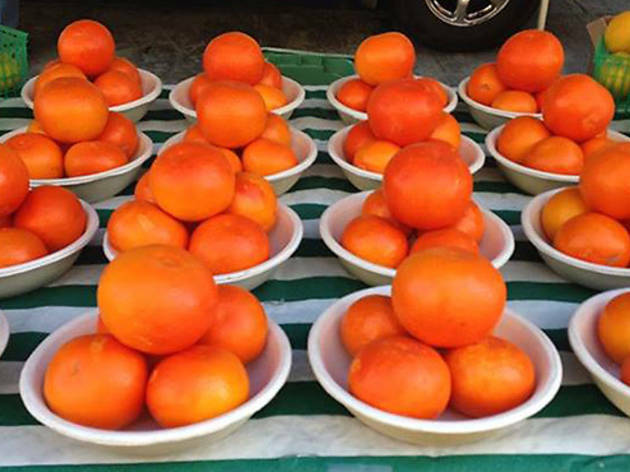 Shop for seasonal fruit and veggies at this market, where you’re bound to spot local celebs. The always jam-packed market has ample (free!) street parking—though you’ll have to be patient—and you should arrive hungry, as samples here are plentiful. As you enter the market, you’ll be greeted by beautiful, fresh flowers; the Arnett Farms stall stocked with apples, pears, plums and peaches (depending on the season) and packages of dried fruit; Frogs Bakery slings croissants, loaves of bread and pistachio-crusted morning buns all made from organic ingredients; while Kays Trays serves up addictive organic salad dressing—and samples of greens and veggies coated with it. Before launching into all the wonderful produce offered at the Pacific Palisades Farmers’ Market, can we talk about puppies? Specifically, all of the cuddly canines up for adoption that are on display next to the market every Sunday. It’s enough to make you want to pick one up and run, but alas, your grocery shopping calls as well. Here is where you can find indulgent carrot cake slices from Bountiful Bakery or fresh gluten-free and vegan treats from Livia’s Kitchen. Bouquets of fragrant flowers abound, as do heads of cabbage, lettuce and broccoli from one of the many certified vendors selling their hard-earned fruits of labor. The occasional food truck will make an appearance, but there is also plenty of prepared food to discover at the stalls—if you can make it past the puppies, of course. 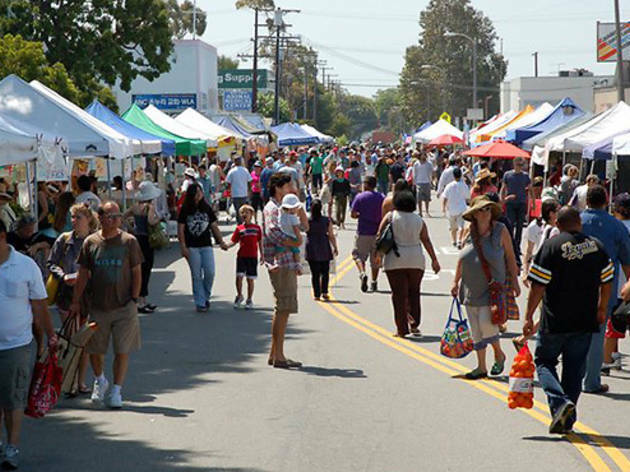 At the Mar Vista Farmers’ Market, the prepared food stalls may just be more popular than the tables of fresh fruits and vegetables hauled here every Sunday by certified farmers. The popular Decadently Raw has a stall here, as does a regular on the market circuit, Homeboy Bakery. But word on the street is that Aris Natural Foods should be your first stop; the Mediterranean stall whips up yogurt dips that have shoppers raving (and coming back for as many free samples as possible). Fill up your bag with groceries, then pick up a crêpe at the Oaxaca Raw stand and head to the dining area, where you can people-watch and listen to the live band doing their thing. Shopping with a pup? The market even offers dogsitting while you browse. 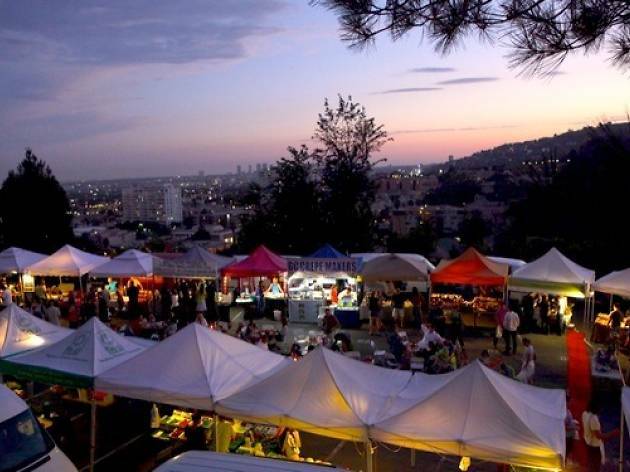 An L.A. summer just isn’t complete without spending a warm evening at the Yamashiro Farmers Market. The historic Japanese restaurant in the Hollywood Hills hosts a small market during the summer months only (usually late May through September, but 2018’s kicked off on April 5) with vendors of all kinds. The produce isn’t exactly plentiful but the real draw of the market is the prepared food and the scene: Look for the “Yamashiro Grill” outside, which cooks up Japanese-fusion plates for cheap. Past menus have included Mediterranean-Japanese plates and Japanese tacos (like miso black cod tacos with wasabi guacamole and ginger-tomato pico de gallo). Tip: Park in the Mosaic church parking lot (on La Brea and Hollywood Boulevard) and take the free shuttle up to the market, which runs every 15 minutes. 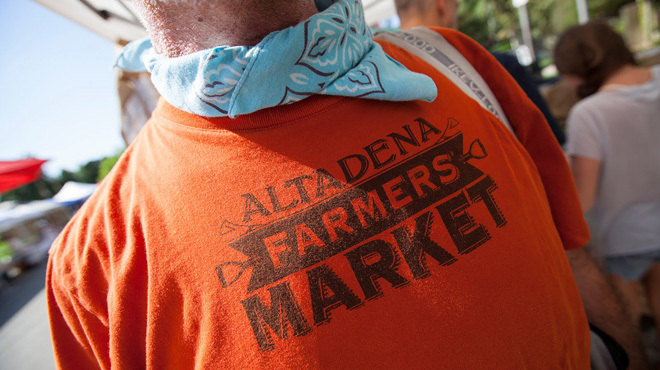 This little market—held in the parking lot behind the Atwater Wells Fargo every Sunday—is a true neighbhorhood mainstay. It’s small, but the patrons are regulars (and mostly Eastside locals) and the produce is top-notch. 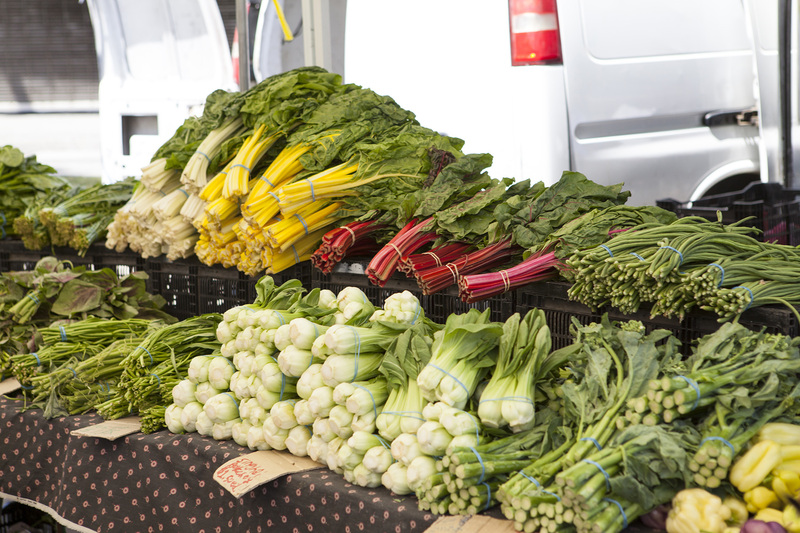 Aside from the normal fruit and veg stalls, the market offers vendors for mushrooms, beans, grains, pies and quiches. You’ll find all sorts of unique treats here, from squash blossom flowers and blistered almonds to unpasteurized sugar cane juice and royal jelly from happy bees. Have a liquid breakfast from the Juice, or grab an iced coffee the Cafecito stand if you’re an early morning market-goer. Bonus: Have any dull kitchen knives, gardening tools, sewing scissors, pocket knives, etc.? Gary’s Knife Sharpening is onsite. Simply drop off your utensils, browse around and by the time you’re done shopping, they’re sharp and ready for you—which is the perfect inspiration to head home and cook with your market groceries. 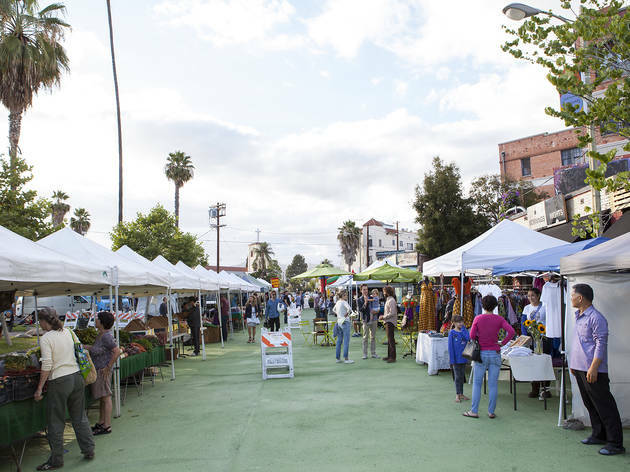 This neighborhood market—hosted Tuesday afternoons and Saturday mornings in Silver Lake’s Sunset Triangle, just east of Sunset Junction—is the Eastside place to see and be seen while you peruse produce. The shoppers here have style, as evidenced by the many (rather pricey) vintage clothing racks and jewelry stands dominating a corner of the market. There are also used books and records for sale, fresh flowers, plus a lot of crystals, dried sage and other hip hippie wares. And there’s a ton of food, too. Grab a coffee or a fresh-squeezed OJ, pregame with a tamale or crêpe and stroll the stalls. Highlights include some pretty incredible citrus vendors (we’re looking at you, Sweet Tree Farms), ice and boba drinks from Honey Honey, mason-jarred goat cheese, farm-fresh eggs and tons of veggies. There are also prepared foods such as hummus, guacamole and kimchi from Dave’s Gourmet Korean Food. Ask for a taste of his miso broth and you’ll be hooked for life, especially in "wintertime." 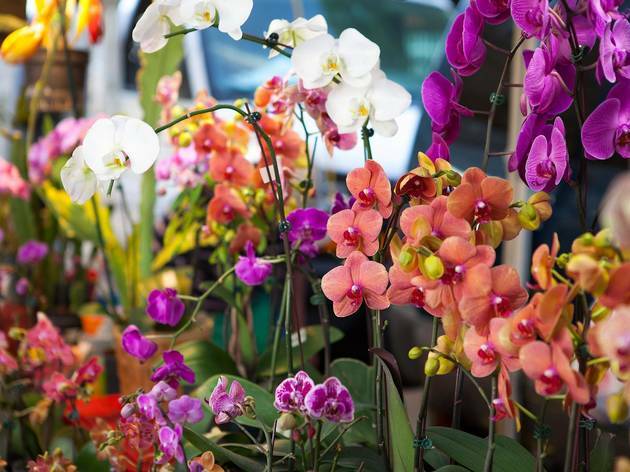 Take a break from dodging tourists and faux superheroes by paying the Hollywood Farmers’ Market a visit (held every Sunday from 8am to 1pm). 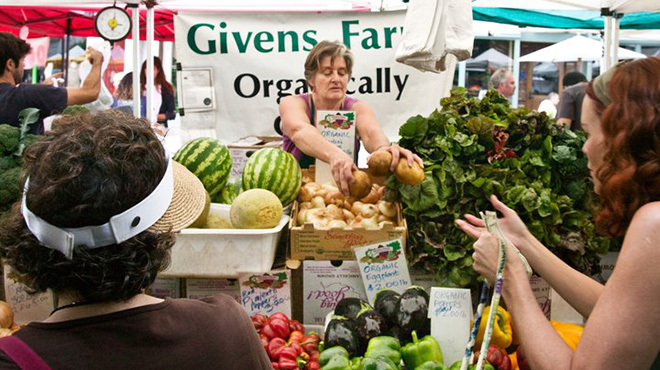 As one of the first farmers’ markets to pop up in California, the strip of vendors that stretches along Ivar Boulevard has grown to nearly farmers, producers and artisans, and also serves as a venue for live music, book signing and mouth-watering chef demonstrations. Stock up on California-grown avocados, dates, seafood, honey, free-range poultry—or head to the stretch of prepared-foods vendors, where you’ll find whole chickens roasting over a spit; Thai food seared, fried and grilled before your very eyes, and loaves of Bub and Grandma’s bread: some of the best in the city. 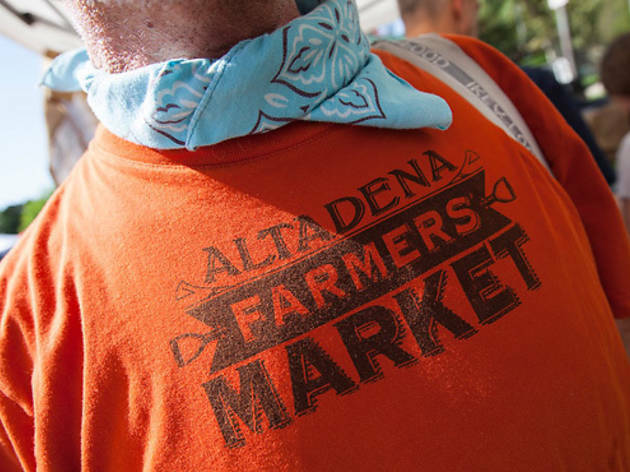 Dozens of booths set up in Loma Alta Park’s parking lot every Wednesday afternoon and evening at the Altadena Farmers’ Market, where market-goers can pick up local produce, dairy, eggs and more from some of L.A.’s most creative artisans. 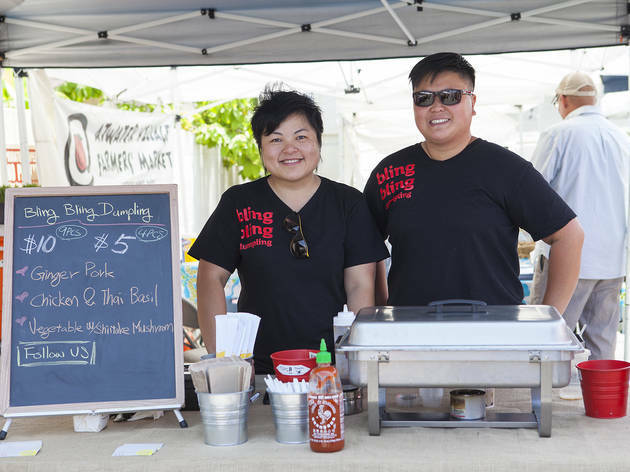 Chat with brother-and-sister team Phillip and Carol Kwan of Mama Musubi over their gourmet rice balls, or heat things up even more with one of Soup Bazaar’s eight weekly flavors of stews (or grab some to-go). If you’ve got a date that night, this is the place to be for picking up gifts that make an impression: Bavette Meat & Provisions offers locally grown meats and handmade charcuterie, and Kindred Biscuit & Crisp’s vegan confections should do the trick. The market’s founder, Joseph Shuldiner, also runs the nearby Institute of Domestic Technology. 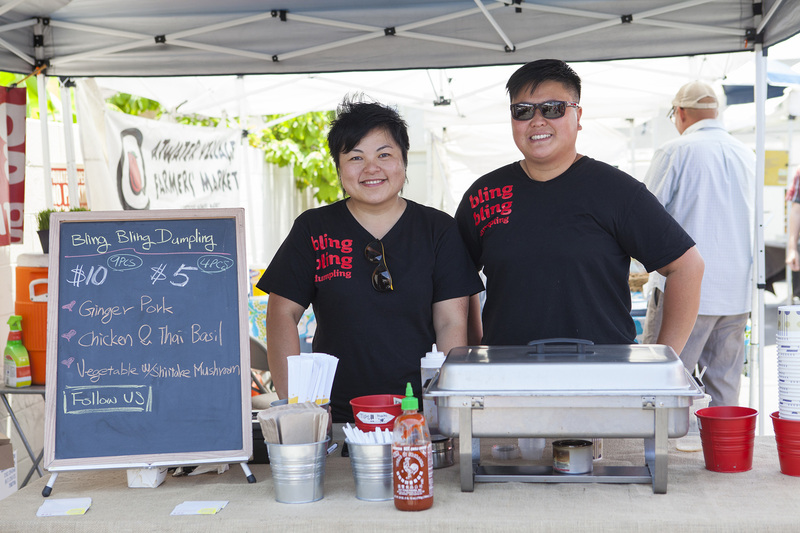 Lining Ventura Place each Sunday from 8am to 2pm, the Studio City Farmers’ Market is a mecca for experimental foodies in the valley. Stock up on blocks of cheddar from Spring Hill Cheese, slices of margarita pizza from Olive Wood Pizza, and kombuchas and bone broths from Probiotic Boost. Chat with the Bolani East & West Foods vendors, who hand you samples of their Meditteranean snacks with a modest, “This will be the best thing you’ll ever eat.” Doing your market shopping with kids in tow? Market-goers with children can keep the young’uns entertained wiht a petting zoo (complete with baby goats, of course) and bouncy castle—and, as an additional incentive for helping with the groceries, face painting. 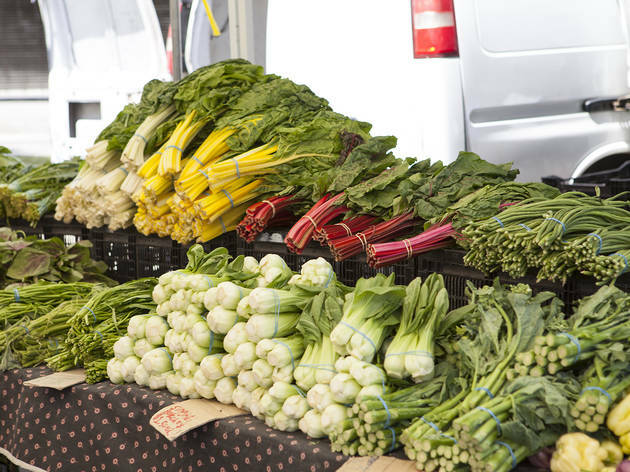 There are a few farmers’ markets scattered throughout Pasadena and its surrounding suburbs, but the South Pasadena Farmers’ Market is by far the best. 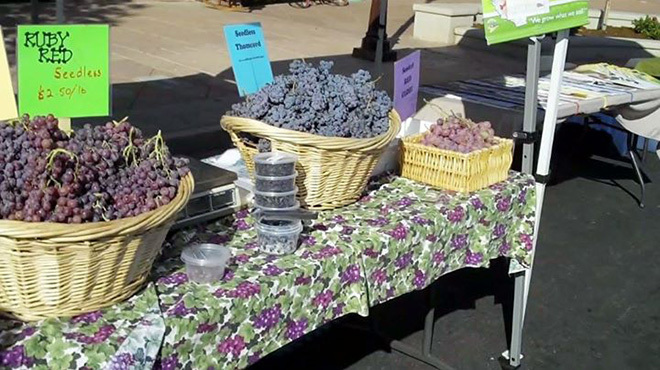 Held every Thursday from 4 to 8pm, the market hosts certified producers selling their goods to conscious valley dwellers. 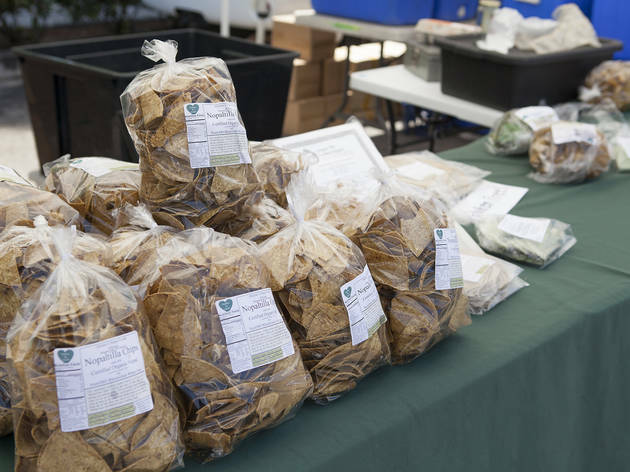 Health nuts can pick up shots of wheat grass from Bolanos Family Sprouts, meat eaters can select cuts of beef from Cuyama-based SZ Ranch, and everything from artichokes to dried beans is up for sale at the Suncoast Farms booth. 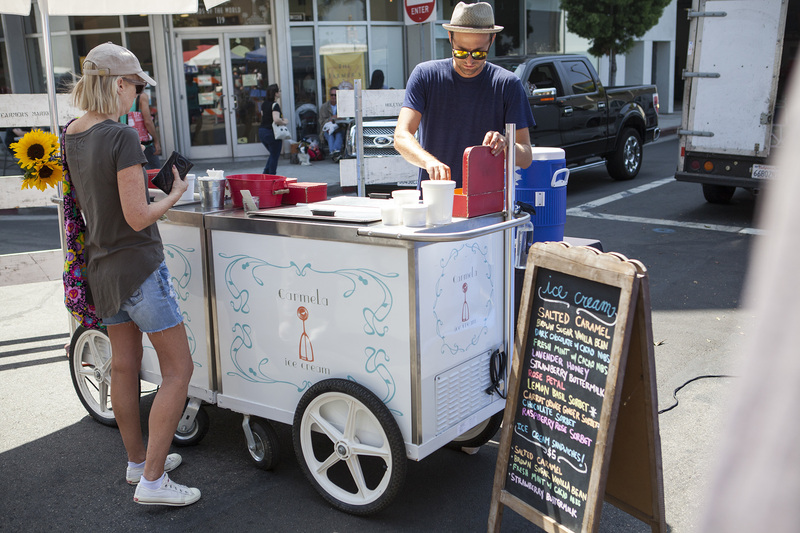 One of the most popular vendors, however, is Carmela Ice Cream. 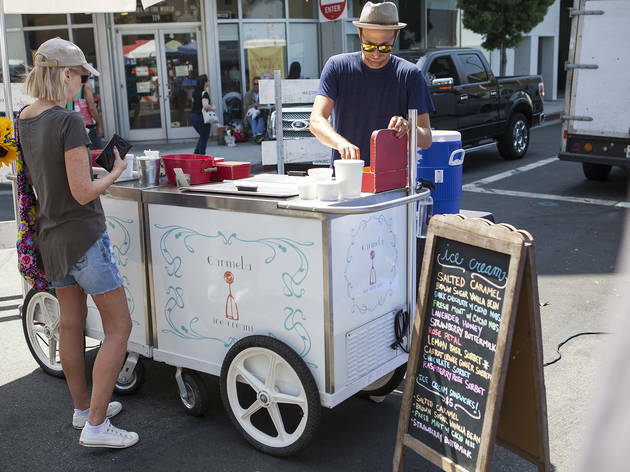 On hot summer days, market shoppers line up for scoops of artisan ice cream and gelato, while those looking for a more savory snack head to Corn Maiden Tamales and Nana’s for gourmet tamales and pupusas. Remember to bring your own bags, and if you’re one of the few Angelenos who’ve embraced public transportation, you’re in luck—the market is right next to the Gold Line’s South Pasadena Station. 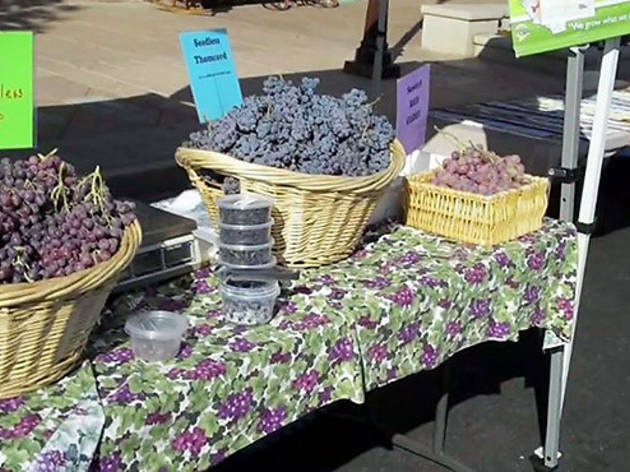 The Burbank Certified Farmers’ Market may be on the smaller size, but quality still thrives here. 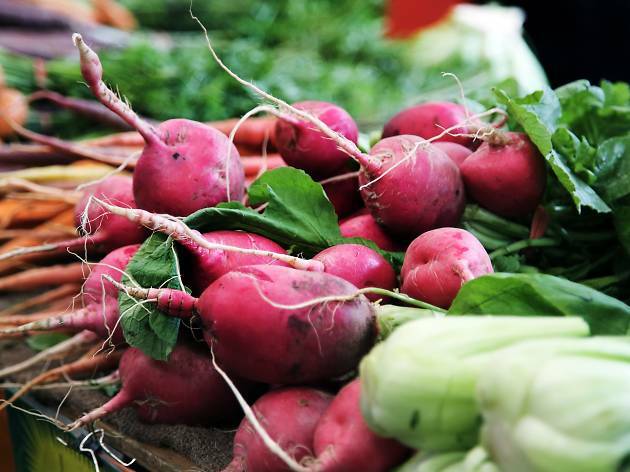 Held in a sizeable parking lot at the corner of Glenoaks Boulevard and Olive Avenue, all of the produce offered is certified California-grown. 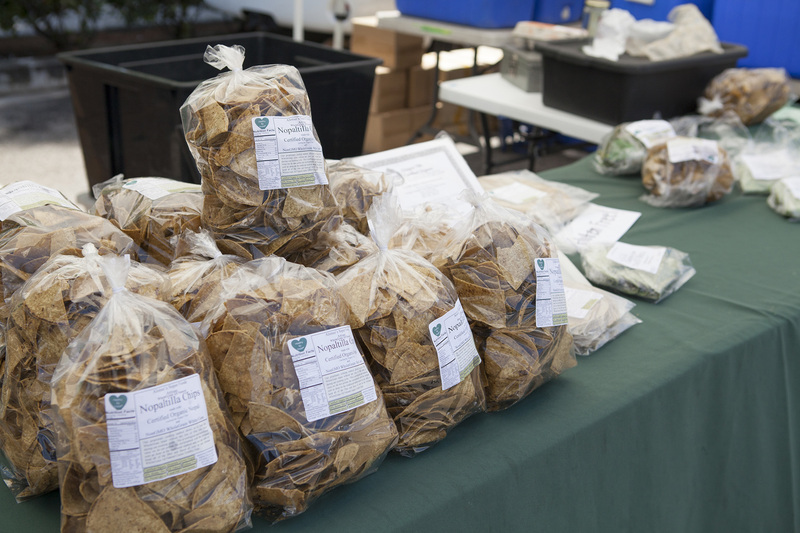 Visit Rancho Santa Cecilia’s stall for beautiful artichokes and avocados, L.A. Funghi for mushrooms of all shapes and sizes (there are truffles, too, if you’re willing to splurge), and Alex’s Fruit and Nuts to stock up on snacks. If you’re looking for eggs, be prepared to wait: the line for Mike & Sons Egg Ranch is the longest at the market, where eggs are sold by the dozen. Prepared foods are less common, but there is market-favorite Dave’s Gourmet Korean Food (get the seaweed salad! ), and you can always snag spoonfulls of Bill’s Bees honey and blocks of pesto jack cheese from Spring Hill Cheese. No need to worry about parking—street parking is plentiful, and you can always leave your car at the fire station on Orange Grove below Glenoaks Boulevard. Looking for more local markets? 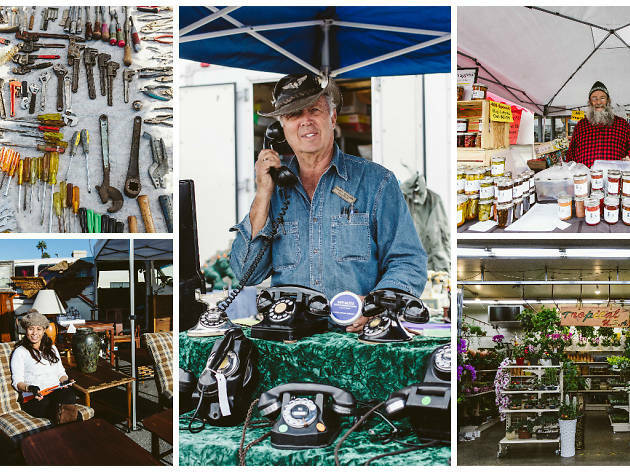 L.A. has marketplaces for everything from antique tchotchkes to rare comic books and begonias in bulk.